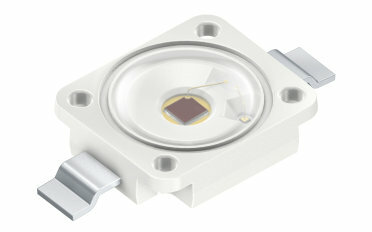 OSRAM Opto Semiconductors' Golden DRAGON products are leading performers in the LED universe. And now the star shines even brighter: The new Golden DRAGON uses the latest Thinfilm/ThinGaN technologies. Besides delivering the maximum possible light from the smallest of sources, this high-performance LED has an exceptionally long lifetime, giving designers and developers the means to take illumination into completely new dimensions. Dazzling bright white light with typical 80 lm @ 350 mA is emitted from a tiny surface. Due to its embedded lens the Golden DRAGON Plus offers even higher brightness and efficacy levels. The Golden DRAGON is characterized by a long lifetime of up to 50,000 hours, due to excellent thermal design and silicone encapsulation. The availability of the complete color portfolio and external optics as well as the extraordinary brightness open up new possibilities for almost any lighting application.